We’d love your help. Let us know what’s wrong with this preview of Theonomics by Andrew Lightbown. At a time when economics, banking and commerce are never out of the headlines, Theonomics asks if theology is capable of informing, shaping and penetrating all aspects of life, and especially economic life. Theonomics argues for the recovery of the classic virtues of prudence, temperance, fortitude, justice and humility as animators of a lively and Godly economy. Six key pr At a time when economics, banking and commerce are never out of the headlines, Theonomics asks if theology is capable of informing, shaping and penetrating all aspects of life, and especially economic life. Theonomics argues for the recovery of the classic virtues of prudence, temperance, fortitude, justice and humility as animators of a lively and Godly economy. Six key principles are offered to help those interested in integrating Christian ideas into the economic sphere: community, solidarity, justice, gift, service and subsidiarity. Through a series of reflections written by practitioners, Theonomics offers encouragement and empirical evidence for the integration of theology and everyday economic activity. "The very word 'Theonomics' is suggestive. Is it possible to live in a consumerist, monetarist society as a reflective and responsible Christian with a vision for the totality of our economic situation? This book offers some powerful and persuasive insights into the possibilities for our collective economic well-being." To ask other readers questions about Theonomics, please sign up. 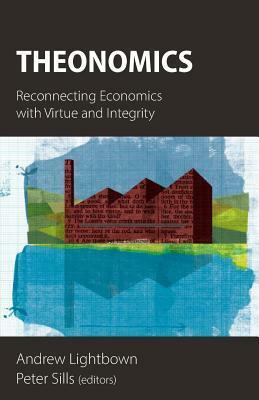 This book Theonomics,Reconnecting Economics with Virtue and Integrity is a very intriguing and thoughtfull concept.I won this book on goodreds first reads for an honest review. I found that this book isnt just a one time read,when in fact its a book that should be studied.community,gift,justice,solidarity,service and subsidarity are the six princi0les to help unders5and and intergrate christian ideas into the economics. I found that at the end of each chapter there is a summary which helps to over This book Theonomics,Reconnecting Economics with Virtue and Integrity is a very intriguing and thoughtfull concept.I won this book on goodreds first reads for an honest review. I found that at the end of each chapter there is a summary which helps to over view anything you may not understand.